Looking for a State of the Art Phone system with Cloud backup? Want to save money? Are you tired of dealing with your current phone provider or multiple companies? 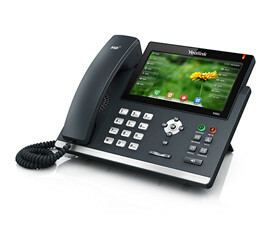 ComSolutions can assist you with your VoIP phone integration. VoIP (Voice over IP) is a tech term which uses today's internet technology to allow businesses to utilize a computer network to operate their phone system with their existing internet connection. As a provider of technical support services for many years, phones are critical in our day-to-day dealings. Our clients need to be able to request technical assistance the moment an issue occurs, so they can focus on running their business. VoIP service is more than just a way to stick it to those overpriced phone companies. It offers many features that you can't get over a traditional office phone system. You can get voice mail that shows up straight to your cell phone or outlook inbox so you can check it on-the-go. Your phone works the same no matter where you plug it in; so, if you need to switch offices, or work from home for a few days, there's no need to go through the hassle of forwarding numbers. You can even get rid of that old paper wasting fax machine and receive all of your faxes digitally! With a VoIP network and the benefit of portability, your employees are accessible anywhere, any time by using their mobile devices with a special dialer. This allows us to keep our commitment to quality service, business integrity and professionalism our clients have become accustomed to. If you are interested in getting a quote, please contact our office and speak with a unified communication consultant right away. Take your information system to the next level with a truly Unified Communications system. Get the training and support you need to automate your VoIP Phone system with Video Conferencing and Collaboration tools, Instant Messaging, Email, Fax, and virtually any other form of communication out there.